This Harry Potter action figure is ready if you are! He's attired in his red Quidditch robes, protective pads, boots, and Gryffindor sweater. Harry brings his Nimbus 2000 broom and a Golden Snitch! "Harry Potter receives 150 points for catching the Snitch! Gryffindor wins!" Harry Potter was a natural-born Quidditch player, and in Harry Potter and the Chamber of Secrets he flew to victory despite having a bewitched Bludger chasing him. This Harry Potter Chamber of Secrets Quidditch Harry Potter 1:6 Scale Action Figure aptly recalls that momentous event. 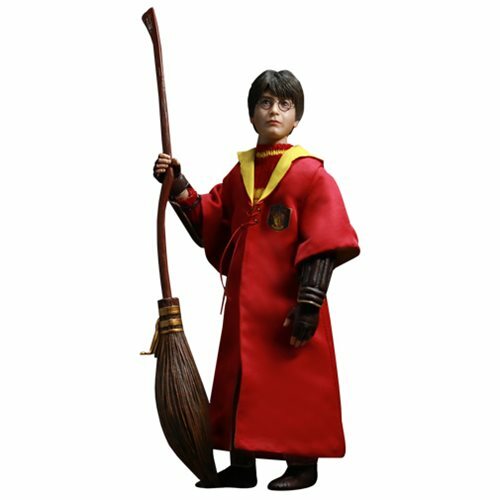 Sporting a hand-painted head sculpt with a highly detailed expression, Harry is sportily attired in his red Quidditch robes, protective pads, boots, and Gryffindor sweater. He's accompanied by his Nimbus 2000 broom and a Golden Snitch, plus a multi-position stand with a green grass pattern base. Ages 15 and up. Will Gryffindor or Slytherin Win with New Harry Potter Quidditch Figures?